The Hall is a magnificent Elizabethan mansion built around a 13th century pele tower. 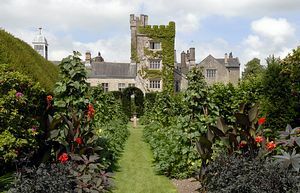 It is the family home of the Bagots and contains a collection of Jacobean furniture, fine paintings, the earliest English patchwork and many beautiful objects. The world famous award winning gardens were laid out from 1694. 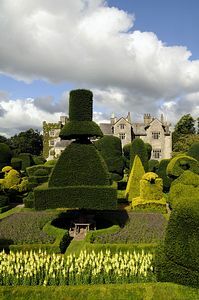 The Topiary, beech hedges and colourful seasonal bedding create a stunning visual impact. The playground, willow structures and Living Willow Labyrinth, situated within the Gardens, provide activities for younger children. Homemade lunches and teas are prepared daily in the house kitchens. Beverages include fresh ground coffee, wine, and the Levens beer "Morocco Ale" brewed to a secret recipe. There are toilet facilities, and the Gardens, Gift Shop and food and drink are accessible. The Gardens have gravelled paths. Unfortunately wheelchair access is not possible to the House due to the large number of stairs and narrow passages. There is an electric buggy available for hire, for use in the grounds. There is a new facility at Levens Hall for those who are unable to access the House. A rolling DVD of the rooms open to visitors, with captions, will be running in one of the rooms in the Bellingham Buttery. 5 minutes from M6 exit 36.